What if you could cut out all the “randoms” and be more like those women who date with intentionality and purpose? You know the women I’m talking about…..
You don’t have to be a prayer expert (or need a miracle) to learn the power of patience, preparation and PRAYER for your future husband. ...All you need is (1) to make a commitment to faithfully pray daily and (2) a step by step prayer guide and devotional to help you along the way as you pray for your future husband. Hi, my name is Jessica Chinyelu and not too long ago, I was EXACTLY where you are. I was that girl in high school that settled for any guy as long as he was giving me some type of attention. I had no real expectations or vision of what I wanted in a relationship. I didn’t even truly understand what a thriving marriage should be like. In 2006, I entered my first REAL relationship and I invested literally everything into this guy. He became my world and pretty much like the God in my life. I had everything figured out and my mind was made up that he was going to be my husband. That’s right! He was “THE ONE!” Despite the fact that he was a liar, a cheater, an abuser and so many other things that I completely over looked. I had no real expectations of men and no real understanding of what a Godly relationship/ marriage should look like. The relationship eventually ended (by him, of course...) and it was literally the most devastating and darkest period of my life. I felt like I had wasted sooo much time and I lost all hope of ever being with a man who honored and respected me. As a beautiful, young woman who desired the blessing of MARRIAGE, I had to STOP settling for men that did not value me. I knew something in my life had to change if I wanted to be with a man who honored God and marriage. I knew I had end this cycle of dating randoms, but how when I felt incomplete without a man in my life? I began to sense God's blessing for my relationship with the man I desired! With my prayers being answered from the daily prayer journals, I sat back in awe of the goodness of God. Things completely changed for me and I was witnessing it first hand. Then, just when I thought things couldn't possibly get any better, the man I desired proposed to me in the month of September 2015! Will you marry me, Jessica? And I excitedly said YES!!! - Now I’m about to walk up the aisle with my soon to be husband and we will be pronounced husband and wife in the month of December 2016. I’m so blessed to be engaged to the man of my dreams, but none of this would’ve been possible without PRAYER, PATIENCE, AND PREPARATION. A 21 day prayer guide and devotional to help you PRAY towards the man you desire, find CONTENTMENT in waiting and ACCEPTANCE of God’s perfect timing! Based on my actual journey, this 21 day devotional will teach you how to pray for your spouse and even provide you with a gift you can give to him on wedding day. 40% of women in America have never been married and may never get married, but have the desire to be a wife. Is this you? While it seems like everyone I talk to is tired of being single and waiting, I find that very few women spend time faithfully praying for their future husband. That means 40% of women in America will potentially settle for a ANY man just for the sake of being married. Will you be one of those women? Or will you be the one who prays towards your future Godly husband that you desire and him be everything you dreamed. Invest in What You Desire and Start Praying For Your Future Husband Today! Though it took me years and lots of wasted time dating the wrong men to learn and understand the depth of prayer, patience, preparation, and contentment, because I believe everyone should have the information they need to pray for thier future husband, I wanted to make this e-book accessible. So when I open registration for the e-book to the public, I will start price at $39. 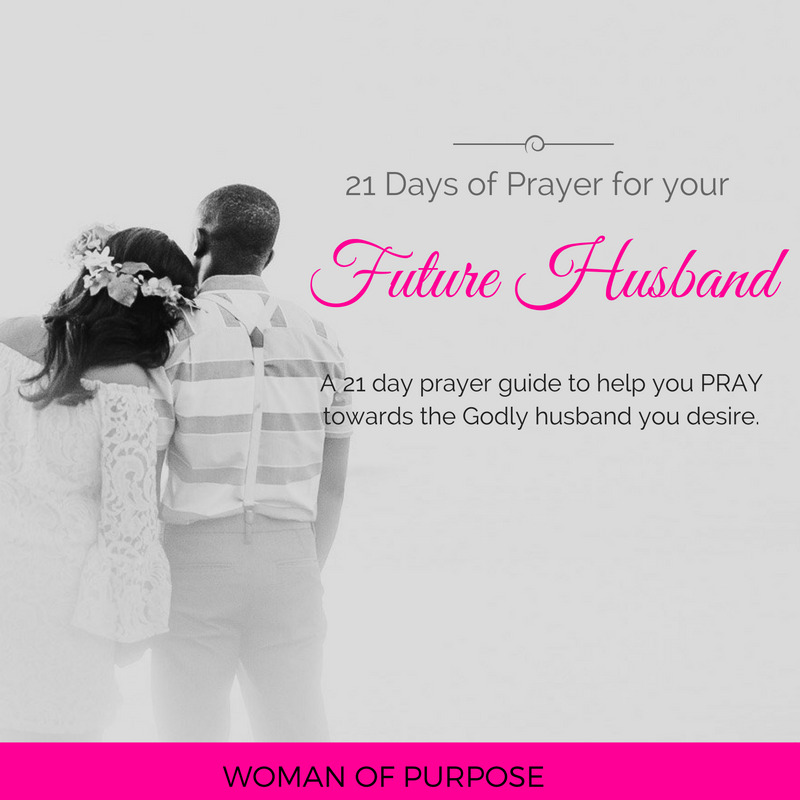 But because you joined me for the Believing for Boaz Challenge, I'm making the entire 21 Days of Prayer for Your Future Husband e-book - and all the bonuses - available to you until Sunday, November 13, 2016 at 11:59am CST for just $27 total. Although you may see many women in great marriages to their Godly husbands, the truth is these women dedicated time to pray for what they desired. If you're not praying about it, then what do you expect God to do about it? The worse thing you can do is go back to dating useless randoms. If you want to receive God's best for you, it starts with you and investing time in sincere prayer. You need a guide to help you on this journey. And the truth is, if you could've done this on your own, you would've started by now. Don't let praying for your future husband be something you place on the back burner. For the price you would pay for a night out with the girls, you can start believing, praying and trusting God for what you've always desired and eventually be ready to receive! Creating a prayer guide and vision for my future husband to help receive God's best for me was one of the BEST decisions I've made for myself. It's also been one of the greatest blessings. What's stopping you from doing the same? Take advantage of this limited time offer and begin Praying for Your Future Husband today! When will I receive everything? If you signed up in time to receive the bonuses, you will receive those materials instantly! Materials related to the 21 Days of Prayer for Your Future Husband and 21 Days of Prayer for Becoming a Future Wife will be made available Thursday, November 24, 2016. I will also be hosting a LIVE follow-up for all those who sign up by Tuesday November 14, 2016 at 11:59pm. The LIVE follow up call is on Thursday, December 29, 2016 at 7pm CST. If you’re serious about praying for your future husband and it's your desire to be married…and you're just not there yet.......it’s 100% because you are in a waiting season that God has you in, you need to work on yourself and also learn and understand the importance of patience. Once you get those areas squared away, you will be content with God's plan and be able to pray faithfully towards this subject matter. If you’re willing buckle down and actually learn what it takes build a solid foundation, you will be in a position to receive in no time. I find that those who constantly complain that “nothing works for them” tend to jump from “thing” to “thing,” without ever applying the last thing they learned. 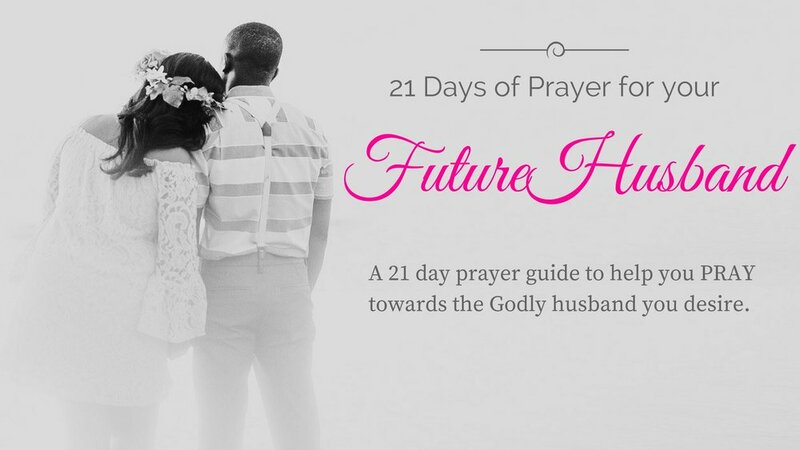 The 21 Days of Prayer for Your Future Husband devotional and prayer guide is “ground zero” for building a “prayer plan” for your future marriage. If you’re serious about asking, praying and receiving for good and you want to do it the right way, you need this resource. What if I don’t like the devotional/it doesn’t work/it’s just not right for me? I 100% believe in this prayer guide and devotional because it’s based on what I personally did to receive the man of my dreams. However, if you get into the devotional and feel like it’s not for you, you have up to 3 days after your purchase to request a full refund, no questions asked. Just email my team at info@iamwomanofpurpose.com and we’ll quickly take care of that for you. This is a 21 day devotional. Take it serious and be consistent! If I have more questions, how can I get in contact with you? Email me anytime at info@iamwomanofpurpose.com! It would be an honor to help you pray towards your future husband. Hopefully you’ll sign-up now so we can start praying the right way!